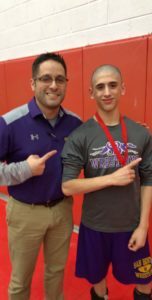 Varsity Wrestling Coach Baldemar Olivares poses with Senior Team Captain Alex Cumpian as the wrestling season comes to a start. Baldemar Olivares is a common face of San Benito: you may have seen him at school events when he worked for KSBGTV shooting football games or graduations, but now you might see him at Varsity wrestling matches acting as Assistant Coach. The opportunity for Olivares to develop his passion for wrestling arrived his freshman year of high school after a bullying incident during football practice. This was 1996, four years after SBHS wrestling made its debut as one of the first programs in the Valley along with those in McAllen and PJSA. Olivares noted that SBHS wrestlers were top dogs in the 90’s and said he and his team plan to get back to that era of dominance. With football season now over, about ten players have now joined the wrestling team, including promising sophomore running-back Kyler Castilleja, making it a complete team ready to command influence. Olivares’ wrestling career went strong for the next three years until his senior year when, 10 matches in, a serious injury to his rib cage forced him to stop the rest of the season.